ELLENTON, Fla., (Oct. 23, 2018) - As anticipation for the 2019 Monster Energy AMA Supercross, an FIM World Championship season builds, Feld Entertainment, Inc., revealed cities and dates for both the Triple Crown and East/West Showdown events. Tickets for the 2019 season are on sale at SupercrossLIVE.com. As the most competitive and highest-profile motorcycle racing championship in the world, Monster Energy Supercross has entertained millions of fans for 44 years. Last year''s 450SX Class Champion, Jason Anderson, looks to make his return with Rockstar Energy Husqvarna Factory Racing in front of nearly one million fans in live attendance over the course of the 17-race series. "We''re really looking forward to defending the Triple Crown Championship in 2019," said Eli Tomac, last year''s Triple Crown Champion and recent Monster Energy Cup $1 Million winner. "The team was excited to take home the inaugural championship last year, and the three Main Event format is the same as the Monster Energy Cup, which we just recently won. Of course, the goal is always to win the overall Supercross Championship, but these races should be fun for the fans because they are short, fast and intense." 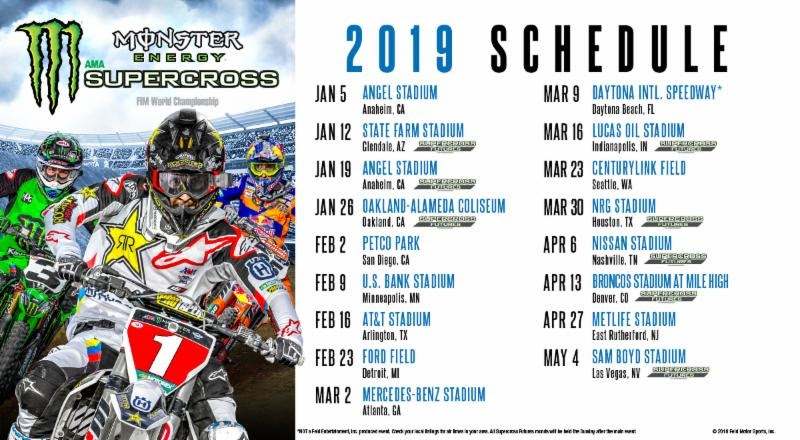 The Triple Crown, at Angel Stadium in Anaheim on Jan. 19, Detroit''s Ford Field on Feb. 23 and Houston''s NRG Stadium on March 30, allows fans to see their favorite athletes race even more than on a typical night of Monster Energy Supercross. Instead of just one Main Event, the three Main Event format, originally introduced eight years ago at the Monster Energy Cup, has continued to thrill fans as athletes are featured three times throughout the night. Qualifying races will reduce the field to the top 22 racers in each class where an Olympic-style scoring system will be used to determine an overall winner, and championship points are awarded based on the overall finish. Two 250SX Class East/West Showdowns will continue to double the excitement at Mercedes-Benz Stadium in Atlanta on March 2 and Sam Boyd Stadium in Las Vegas on May 4 as fans will have the opportunity to see 22 of the fastest riders from both regions of the 250SX Class Championship (who usually don''t compete together) battling each other for victory. The Main Event will be the first and only time throughout the night that all of the 250SX Class stars will line up on the gate for a 15-minute plus 1 lap Main Event where winner takes all. "I think the East/West Showdowns are really cool and a fun change in the schedule, especially for the fans," said Christian Craig of GEICO Honda. "The best part is probably finding out which coast is more dominant or if they are pretty even." The 2019 season is shaping up to be one of the most-anticipated in recent history with four rookies jumping up to the premier class with Monster Energy Kawasaki''s Joey Savatgy, Autotrader/Yoshimura Suzuki Factory Racing''s Justin Hill and both defending regional 250SX Class Champions, Rockstar Energy Husqvarna Factory Racing''s Zach Osborne and Monster Energy/Yamaha Factory Racing''s Aaron Plessinger, all making their 450SX Class debuts at Angel Stadium on Jan. 5. Adding to the competition will be Team Red Bull KTM Factory Racing''s Marvin Musquin and newly-signed teammate, Cooper Webb, Monster Energy/Yamaha Factory Racing''s Justin Barcia and a slew of additional talent, including Smartop Bullfrog Spas Honda''s newest member, Malcolm Stewart under the tent with top veteran Justin Brayton. Additionally, the tracks in 2019 will showcase expanded features and unique city-centric obstacles, including a large "speedway style" flat turn, split lanes, elevated turns and back-to-back whoop sections in select markets. Sand will be its own obstacle in seven markets, and over/under bridges will be used in four markets. Lastly, in eight select markets, Supercross Futures, an AMA Amateur National Championship, will establish itself as the world''s premier developmental platform for amateur supercross racing culminating on October 20-21, 2019 in an AMA National Championship in Las Vegas.